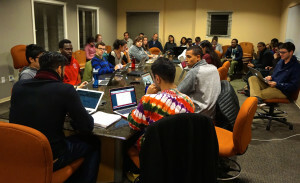 In its fifth meeting this quarter, the 17th Undergraduate Senate discussed a bill to rename Stanford property currently named after Junipero Serra out of respect to the Indigenous and Native American community. In addition, an updated version of last week’s bill to abolish Senate committees saw further discussion among Senators, leading to broader conversation about the Senate’s engagement and communication with the student body. Leo Bird ’17, who wrote the bill to rename Stanford property, explained that his resolution was a means of igniting a conversation about the individuals memorialized by Stanford. In particular, Serra is alleged to be associated with the deaths of many Native Americans in California during the Mission Era. He added that he had not known about Serra himself prior to a Native immersion program at Stanford and that he hoped the conversation would engage and inform students about inclusivity on campus. Support for the bill was immediate, though other Senators argued that it would require significant effort to educate students on the historical facts behind the change. There were some concerns that the bill would open a floodgate of requests to rename roads and buildings, including those outside University jurisdiction, but ASSU Executive John-Lancaster Finley ’16 claimed that those issues shouldn’t stop them. Bird rooted his proposed change in Stanford’s tradition of questioning controversial legacies, arguing that it upheld rather than attacked university values. However, Stanford Review editor Harry Elliott ’18, who was also present at the meeting, questioned the resolution’s focus on the act of renaming rather than starting worthwhile conversations. In response, Finley pointed out that Senate bylaws mandate that resolutions propose actions rather than merely raise topics for student discussion, which are generally the prerogative of the Faculty Senate. The bill also specifically mentions the campus-wide OpenXChange initiative as a forum for University dialogue on the issue. The process of bringing the dialogue to the student population is already in the works. On Monday, Finley and ASSU Vice President Brandon Hill ’16 spoke to the Native American community about the proposal, and they will be meeting with the Graduate Student Council and the Faculty Senate in the coming weeks. Last week’s debate over the bill to eliminate Senate committees was reopened by Senator Matthew Cohen ’18. Cohen rewrote his resolution to include provisions that encouraged Senators to commit to individual projects and be held accountable by the Senate for their progress. Other Senators expressed their reservations about abolishing committees outright, preferring to incorporate the bill’s measures on personal projects and accountability into the current system. Hill reframed the discussion in terms of realizing the Senate’s aspirations and potential as opposed to criticizing the current system. In addition, the Senate also discussed funding issues, including a bill to provide The New York Times to students free of charge and funding requests from Dance Marathon and the Black Pre-Law Society. Executive director of the Haas Center Thomas Schnaubelt attended the meeting to start a dialogue with the Senate on linking Cardinal Service opportunities to student organizations and the student body at large. “We want to make public service a distinctive feature of an undergraduate education at Stanford University,” Schnaubelt said. The Senate agreed to provide support in publicizing the Cardinal Service initiatives and bridging communications between the Haas Center and student groups. Contact Fangzhou Liu at fzliu96 ‘at’ stanford.edu.